Galena, up in the northwest corner of Illinois, is an authentic tourist town regularly making lists of top ten charming small towns in the US. I was barraged by the most billboards of these travels as I approached this town of 3,500 advertising hotels and restaurants and even Segway tours. It's Main Street was several blocks of glitzy dining establishments and boutiques selling all manner of touristy items from candles to fudge. Just when I thought I had come to the end of the gauntlet a sign promised "More shopping and dining" ahead. Much of the town is listed as a National Historic Site. The town got its start as a mining town for galena, a lead ore. It sparked the first major mineral rush in the US in the 1820s. The town's population exploded to over 10,000 rivaling Chicago as the largest city in the state. By 1845 it was producing 80 per cent of the country's lead ore. When the demand for lead declined in the early 1900s, so did the town. Though the Mississippi River is nearby, the town is on its tributary, the Galena River, as the land around their confluence is too marshy to build on. The surrounding terrain is hilly enough to have a ski resort, Chestnut Mountain. Along with its quaintness, another of its allures is the home of Ulysses S. Grant. 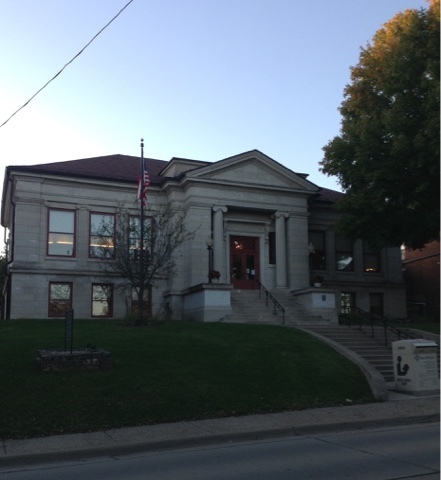 What enticed me though was its Carnegie Library, a classic beauty of limestone hauled all the way from Indiana. It resides on Bench Street, one steep block up from Main Street. 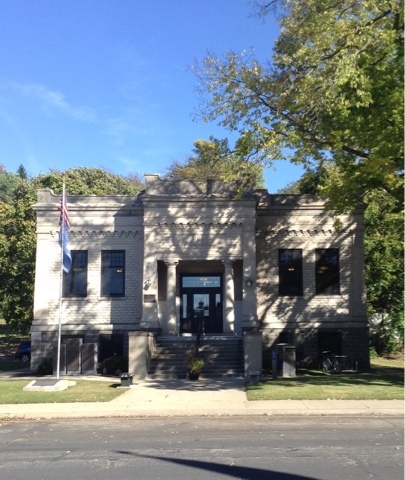 A local businessman doubled Carnegie's contribution of $12,500 to make it a little more grand than the standard $10,000 libraries he funded. It filled its lot, so there were no additions. I had been biking for over one hundred miles on a road long known as the Galena Highway that brought prospective miners to the town. I picked it up in Dixon, the home town of Ronald Reagan. His boyhood home, which one could tour, was on the same street as its library, five blocks away. Though it wasn't a Carnegie, it was built in the same era and could be mistaken for one. It had a brochure listing the 125 books it held on Reagan. My trek between these two presidential towns also included a connection to the most famous of the presidents Illinois provided the nation--Abraham Lincoln. 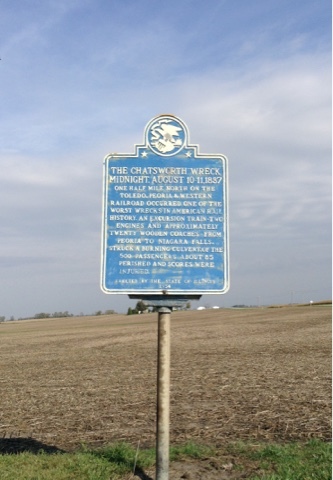 A plaque announced he had camped along the road as a private in the army during the Black Hawk War in 1832. It gave the exact days of June 8 and 12. 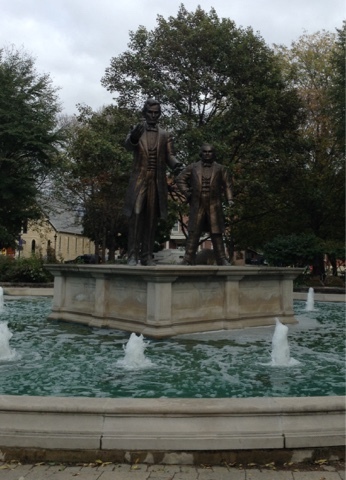 The day before in Ottawa I lunched on a bench in its main plaza as Lincoln and Douglas gazed down on me. It was there, in front of 10,000 people, they held the first of their seven legendary debates throughout the state. Before I reached the Galena Highway I passed another plaque near the site of one of the worst train crashes in US history. The quiet town of Mount Carroll was full of plaques outside historic homes and its Carnegie Library and Shimer College. 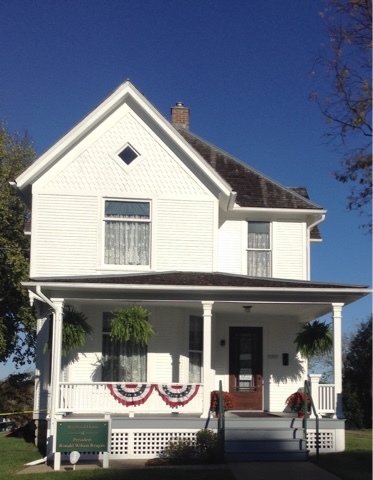 It's entire historic district had also been placed on the National Register of Historic Places. Most of it, including the library, was on a brick road. 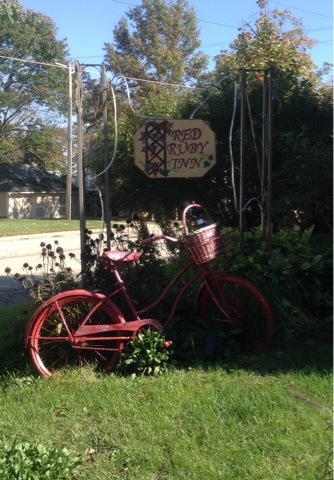 A bed and breakfast on the street advertised itself with a bicycle. Even amongst all the historic homes, the library stood out as the most magnificent building in the town. Carnegie was chiseled into its facade and his portrait was the first thing one saw upon entering gazing down from above a book shelf. 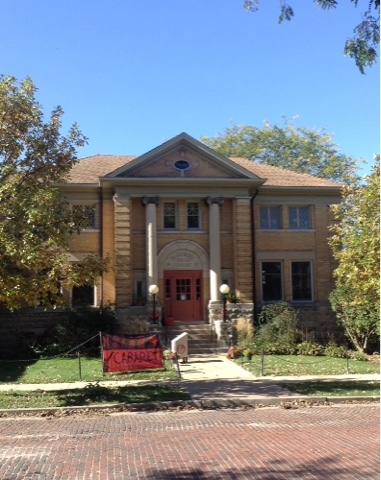 It's Shimer College was founded in 1853 and affiliated itself with the University of Chicago. It moved to Waukegan in 1978, then to Chicago in 2006. Mount Carroll is also noteworthy for being one of the coldest places in Illinois. Up to 1999 it held the record for having the coldest temperature in the state--minus 35 in 1930. Congerville beat it out by one degree. I discovered an even greater oddity when I stopped at the Carnegie in Savana nine miles away, where a bridge spans the Mississippi to Iowa. I was told the town had the only stoplight in the county. It's not because the county was full of roundabouts, but simply that in small-town America there isn't much need of stoplights. Rather than the common temple design, the Savana Carnegie had adopted the rare fortress motif. It's accoutrements out front reflected its militaristic bearing with three panels listing all the residents who had served in WWII. The Gettysburg's address was etched into a plaque below the flag. 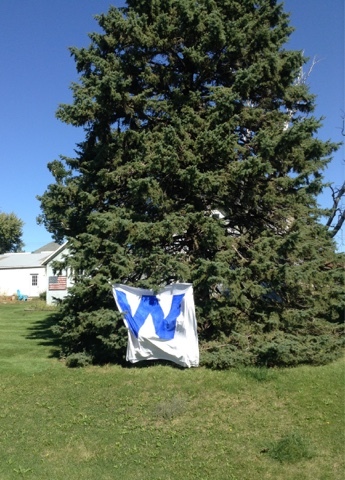 Even over one hundred miles away from Chicago "W" flags are an occasional site, some of the home made variety. I haven't seen any on cars though. They were a common site last year in Chicago during the playoffs, not only on cars but on the roadside as well, broken off from their window mounts. I was hoping another Cubs World Series appearance would spark a second outbreak of car flags and another scavenging treat, but it doesn't look like it will be after they fell to the Dodgers again last night, now needing to become just the second major league team ever to come back from a 3-0 deficit. With no prospective flag harvest, I am feeling less inclined to hurry back. I'm already checking mileage to how far south I'd have to ride to reach the next cluster of Carnegies after finishing off the last two up here in the northwest corner of the state. The riding is too good to stop. If I continue on to the twenty that I have yet to get to I could make this a 3,000 mile ride. Then 4,000 by making a clean sweep of Indiana. Yes, I am a bicycle addict, and the last thing I want is to be saved.